IN THE DRUDGERY of an internist’s daily life, there are moments of surprises that come along the way. This happened to me two days ago. I checked on a fifty-something patient, someone my service and I were managing as a case of upper gastrointestinal bleeding secondary to a probable GI malignancy. I had told him during our first encounter that he should observe the color of his stool. It was to be his “assignment.” I wanted him to pay close attention as to whether it looks like asphalt or dinuguan—local descriptors of melena that I have found useful in my practice. Dark, tarry stools are a useful sign of acute or active bleeding anywhere in the GI tract. There's nothing new in Sana Dati. It is, for purposes of classification, a love story. A woman gets married to someone she doesn't quite know, just about a week after her fiancé—a respectable, intelligent, rich man—had proposed to her. She gets the jitters, complains of stomachache, but looks disinterested during the video shoot hours before her actual wedding. We later get the idea that something is wrong: she loves someone else; that person, however, is already dead. The narrative is ordinary, but there's something refreshing as to how it has been told. Maybe that's the difference. It does not use the usual Star Cinema romantic film formula. The characters speak naturally, as normal people in Metro Manila do. There are no obnoxious best friends, character-less entities usually fielded as dialogue fillers in other films. We don't feel kilig; we feel sad and supportive and hopeful that things will turn out well. The scenes are solemn and contemplative, all expertly shot—a great feat, given that the film only had a little less than three million to be produced. The music, too, does not invite giggles. It is a simple movie told extraordinarily, certainly worth your while. TIM KREIDER’s essay, “The Summer That Never Was,” captures the longings of someone who had laid out his plans for a trip to Iceland, a to-do list that never materialized. (I want to go to Iceland, too, partly because the landscapes look like they're from another planet, partly because I want to learn how to pronounce the weird names of places.) There’s a familiar tone to it, I suppose: the fact that the possibilities for travel, leisure, and adventure are endless; yet I am limited by my career, which, in a sense, is of my own choosing. The essay speaks volumes to me, a doctor in training trapped—by choice—in the hospital, wanting to do so much more. "I’m not old but I’m not young anymore, either, and if you’re a procrastinator and a ditherer like me you can manage to sustain until well into midlife the delusion that you might yet get around to doing all the things you meant to do; making a movie, getting married, living in Paris. But at some point you start to suspect that you might not end up doing that stuff after all, and have to consider the possibility that the life you have right now might pretty much be it." LAST NIGHT I lulled myself to sleep by browsing through PubMed, the largest, most comprehensive database of medical literature. I searched for random things, keyed in "funny" as a Boolean free-text search term, and found a case report about a patient, chronically diabetic, who presented with extreme funny-ness. There is a wealth of material there, but it can read like a phone book if one doesn't know what to look for, and how to look for the material desired. Now, on to the subject of research. Publish or perish still remains the dogma in academic circles, and it's a shame that in our country, the culture of research is still too young, too immature, to even take flight. We must congratulate our local scientists and researchers for keeping at it, despite the lack of support, resources, and encouragement. 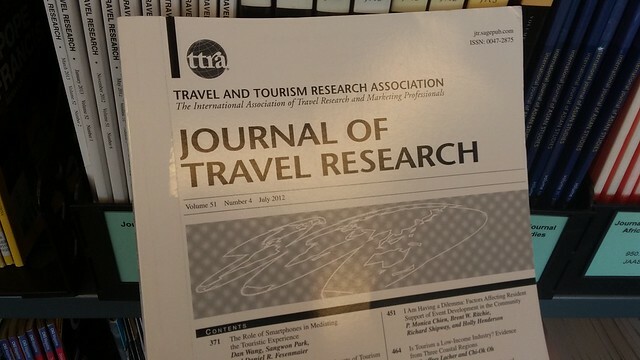 If I had the chance to be editor of a scientific paper, with all its perks and pains, I'd probably want to work here: The Journal of Travel Research, which I found at the Singapore National Library. Imagine all the traveling I will do, for the sake of "knowledge." But then again, why write for a scientific journal when one can always do feature articles of magazines? Or maybe work for National Geographic? One of my dream jobs, definitely.